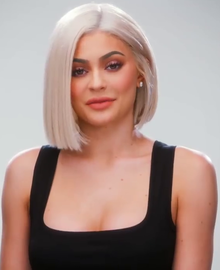 Kylie Kristen Jenner (born August 10, 1997) is an American reality television personality. She is known for appearing on the E! reality TV show Keeping Up with the Kardashians. She is a daughter of Caitlyn Jenner and Kris Jenner. She has one sister, Kendall Jenner, and eight half-siblings: Kourtney, Kim, Khloé, and Rob Kardashian, along with Brody, Brandon, Casey, and Burt Jenner. Kylie Jenner is famous for creating her own cosmetics line called Kylie Cosmetics. She created a vast amount of products such as matte lip kits, gloss lipsticks, eyeshadow palettes, eyeliner, blush and highlighter. She also recently created her individual clothing line where she sells items from customized undergarments to customized sweatshirts. On February 4, 2018, Jenner announced that their daughter, Stormi Webster, had been born three days before, at 4:43 PM PST, weighing eight pounds and nine ounces. ↑ Nicolaou, Elena. "Real Talk: How Tall Are the Kardashians?". Retrieved 2018-02-04. This page was last changed on 18 April 2019, at 11:22.